22 October 2010, at 11:12p.m. MEXICO – The first edition of Figap/VIV America Latina launched on Thursday, in Guadalajara, with a truly international expo hall, writes Chris Wright, Editor of ElSitioAvícola. Exhibitors from around the world are participating in Figap/VIV America Latina, a combined event which takes place for the first time ever in the Expo Guadalajara and runs from Thursday 21 to Saturday 23 October. Two things were very obvious upon entering the exhibition hall: the presence of feed milling equipment manufacturers and the strong participation of Chinese companies. This is a show for the Latin American agribusiness sector þ beef cattle, dairy cattle, pigs, poultry and aquaculture. Aside from the strong Chinese presence, various other countries also have special pavillions, including France, Netherlands, Spain and UK. Many US companies are also participating, and there are even pavillions from Illinois and Iowa. 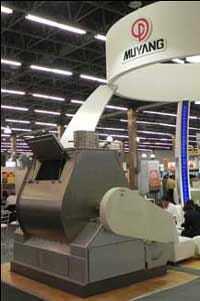 The strongest presence of exhibitors and participants, however, is from Mexico. That is not a surprise, since the state of Jalisco is particularly strong in egg and pork production – among other agribusiness sectors. The event organisers explained that, aside from the 1,500 pre-registered participants, many more have arrived since the show opened. Beyond those numbers, there are 300 participants in a special technical school, and at least 200 more attending the plenary sessions and technical conferences that are part of this event.